I already had the models primed, assembled and they were on finished bases. I had to use them for a tournament last week. Having them sit in my bag unpainted wasn’t to my liking, so I decided I wanted them finished first. 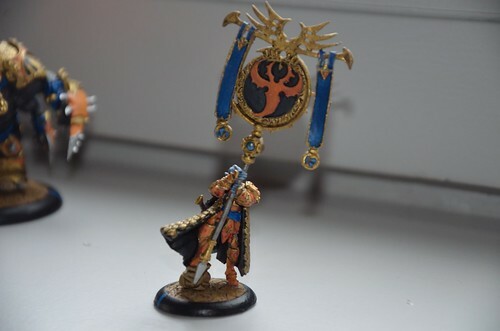 Tournament report #1: First times are…well they call them first times for a reason. I went to the Pumpkin Bash SR event in Oberonn Hasselt this Saturday. So 3 rounds, 50 points. My caster pairing was Xerxis1 / Mordrikaar. Where Mordrikaar serves as the Cryx drop. The “problem” I see with this pairing at the moment is the seemingly smell Cryx presence at SR events these days. Cryx player in a group of 24 participants is rather low. If the Divide and Conquer hadn’t been removed, this would have been an issue for sure. Game 1 was pretty obvious from the start. I faced one of the players I play against on a weekly basis and while I’m starting to find answers to his Runes of war, I’m still far from getting to a positive outcome. I keep getting stuck because it’s brick vs brick and his brick is way faster. Depending on the situation I even have to feat defensively, removing any chance to remove all the heavy armor targets staring me in the face. This match up hinges completely on my ability to position my models and how I prepare for what’s coming my way. Since I’m not an expert Skorne player (yet), this is far from perfect and that’s what loses me this match up time after time. I’m working on it and I didn’t do horrible, I learned a few more things from the mistakes. Game 2 I faced Gorten Grundback, with Xerxis. In the end not a loss due to wrong choices or errors on my part, just lots of hate from the dice gods. Game 3 was Skorne vs Skorne, Xerxis vs Xerxis. The other player didn’t have a fist of Halaak list. I was able to get rid of some beast handlers early on using the incendiarii. The brutes came up on one flank, the titants on the other. With the brute to far up front he wasn’t able to leach fury and the turn after it wasn’t really useful as he couldn’t force it. 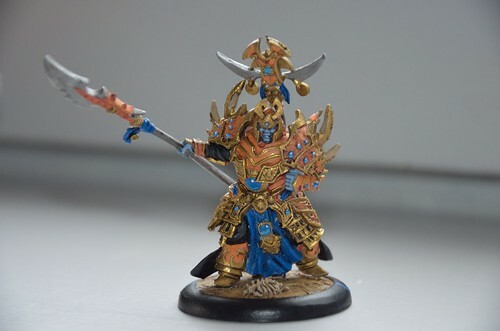 The first crucial mistake was that he activated Xerxis to cast inhospitable ground and then continued with his other activations, never having moved xerxis. This was in his second turn and we were playing a killbox scenario (Fire Support). SO after my second turn I got 2 points for free. He committed his gladiator in order to remove Cetrati, but the dice were against it. 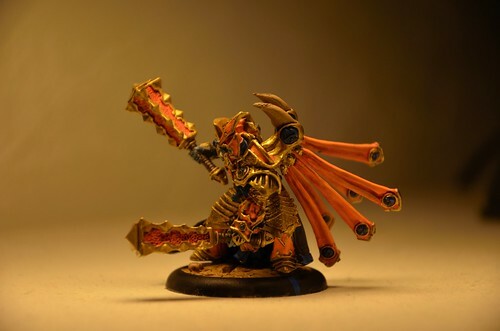 He then committed his bronzeback to remove Cetrati and other models, same as with the Gladiator, he was able to remove models, but not one model per attack as he seemed to have calculated in his plan. 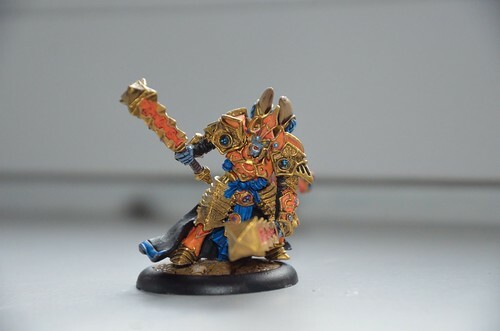 Since the Bronzeback is pretty banged up already I decide do send in the gladiator to hopefully finish it off. Which it does. This I could send in Tiberion to have a go at the Gladiator. Tiberion performs as he should and no more gladiator. Both the brutes are full on Fury and will have to take frenzy check the next turn with them being outside of Xerxi’s control. I take some shots setting the remaining models on fire as much as possible. The turn after he tries to hurt the 2 Titans as much as he can, however it doesn’t really dent them much, with the feat up. The both of em also block models from going towards the flag and objective. The brutes don’t do much, one has 1 fury left on it, and decides to charge a model. 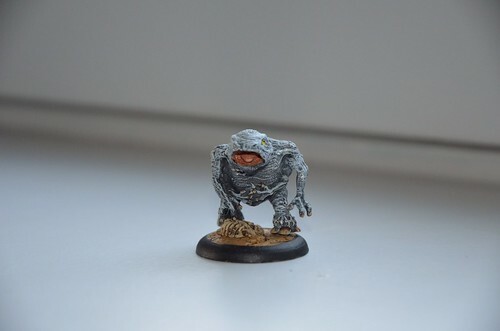 He decides to risk 3 free strikes from beast handlers, and then he found out why that’s a bad idea…The brute got to his charge target, however with 1 fury for charging and 2 more added by the Beast handlers, he could only do the one charge attack and no longer had the option to boost on hit. The attack hit, and did minimal damage. On my next turn I moved Xerxis in base to base contact with the flag and started dominating. This brought me to 4 points and as he was unable to get close to the flag, I got to 6 points when he ended his turn. All in all a very nice game, placement was what made it possible to go for scenario. in time an assassination would have become available, however that would have taken at least one more turn. I had a fun day, and while I see I still have a long way to go towards becoming a true Tyrant, I am well on my way and I am progressing at a steady pace. The next tournament will be on the 16th of November in Namen and it’s called Steamclash 2014. 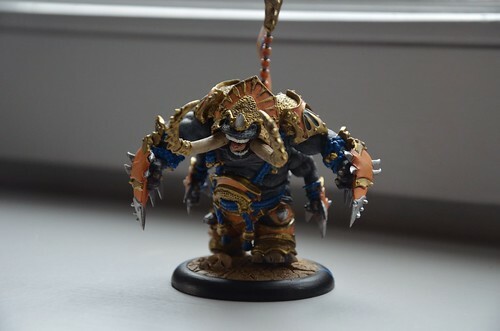 Got this “Little” guy done last week, but I didn’t get to take any pictures until Sunday. I was able to get everything in order for the tournament tomorrow. 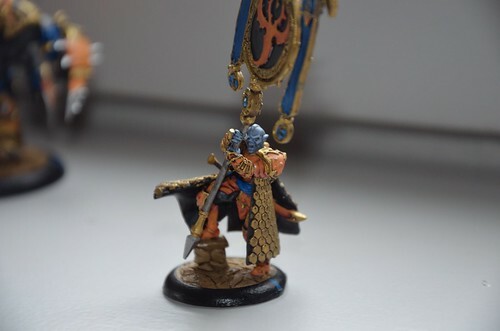 Aside from the unit of Arcuarii, I also finished my bronzeback, but I didn’t have the time to take pictures of the model (and no daylight so pictures wouldn’t be to hot either). 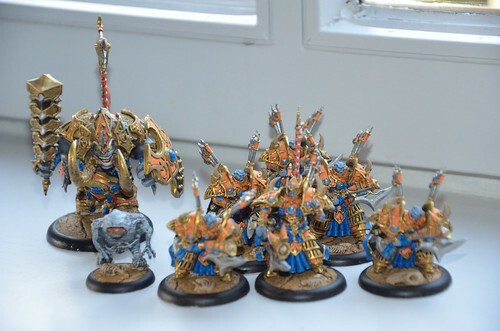 I’ll post some Bronzeback pictures and a small report on the first Skorne tourney later this weekend. 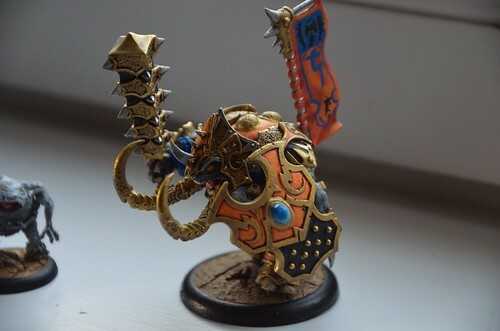 I had an arrangement so I could borrow the models I hadn’t assembled / painted from a friend, and that way I could play the Steam Roller without the stress of finishing 2 50pts lists in 3 weeks. Sadly that seems to have gone out the window, and it leaves me with just this week to get things in order. I do have some tricks up my sleeve, but I don’t know if it will be enough. War beasts: Tiberion is done; Krea and Drake will be assembled and primed on time. Will try to get the bronzeback and gladiator out this week. Solos: Agonizer is done. Gobbers and will breaker will be primed. Units: Blood runners are primed, 1st unit of Incendiarii is done, 1st unit of Arcuarii is almost done. 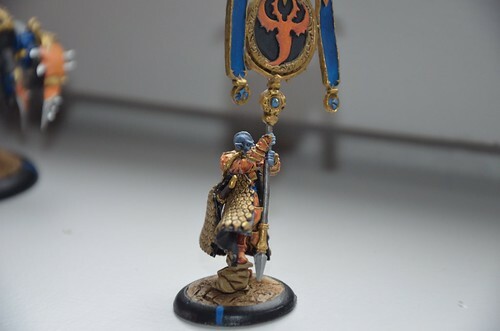 Tycommander and standard will be primed (without the actual flag sadly). Nihilators will either be primed or painted, that depends on my progress. 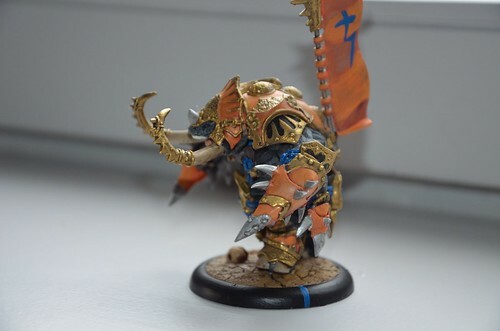 Vorkesh is done. 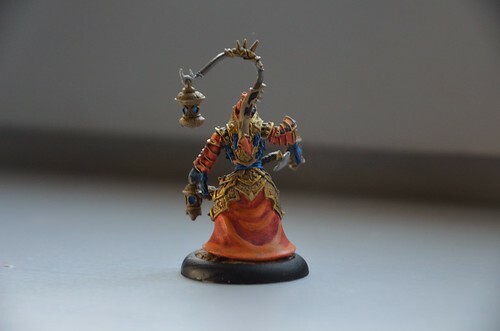 So for the rest of the week, leaving me with 3 full evenings of painting and one night with max 2 hours of painting time, I’ll have my hands full. 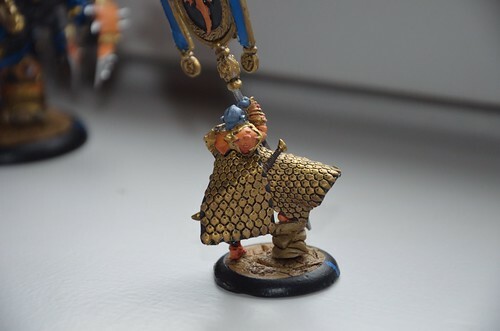 For the 2nd unit of Incendiarii and Arcuarii, I am planning to assemble 2 of each unpainted and add the spare one’s from the first 2 units, giving me 4 min units with minimum effort. 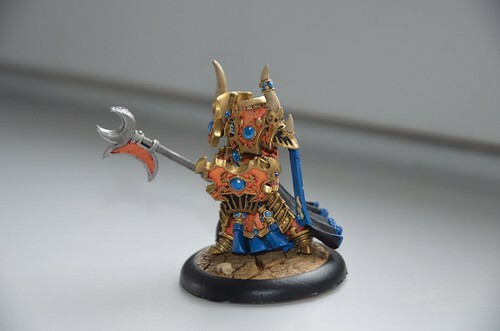 If time runs out, the gladiator can be glued to its base, I painted Tiberion on its base as well and it worked out. 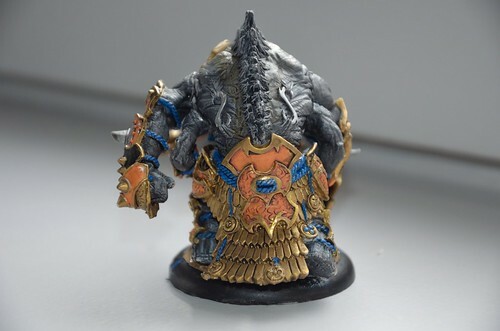 So it being on its base primed won’t be a huge problem, even if I would prefer painting it without the base. The bronzeback is a different story. 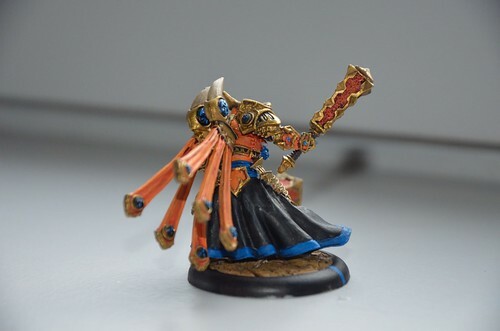 I kept its arms and body separate for painting and I foresee problems painting the inside of the skirt if I put it on the base before painting. 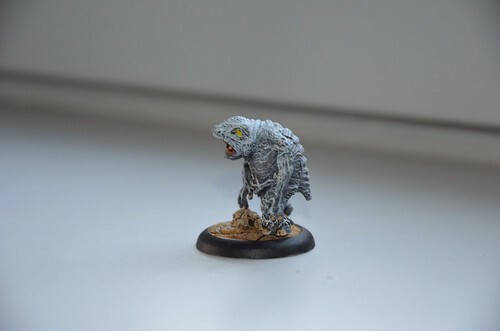 Conclusion, I really need to get the bronzeback done this week, no other choice. 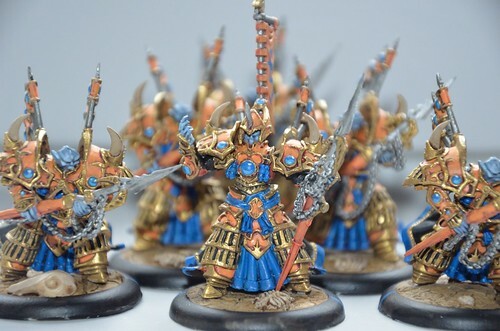 The nihilators are a 50/50 option, the will be paintable on their base, but I would prefer them baseless for painting if I have the option, so I hope I can get to them in time so I can achieve that. 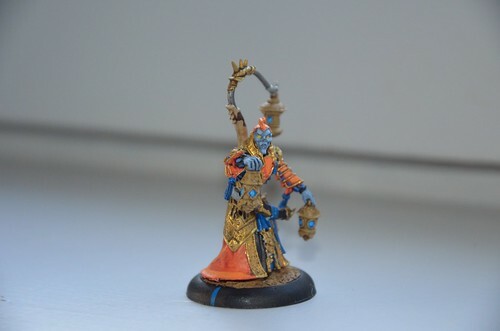 The Arcuarii take longer than I expected, I was hoping to get at least half done by now and so far 2 are finished. SO this evening they have to get done. 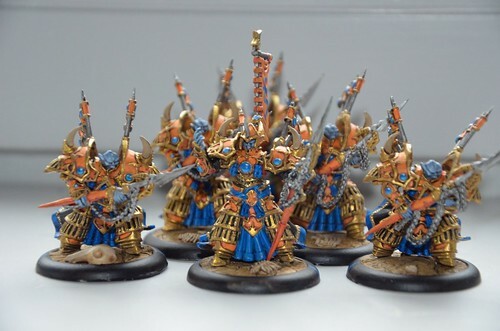 I don’t own the beast handlers yet (waited for the full unit box and now its awaiting delivery), however I can possibly borrow those from someone. 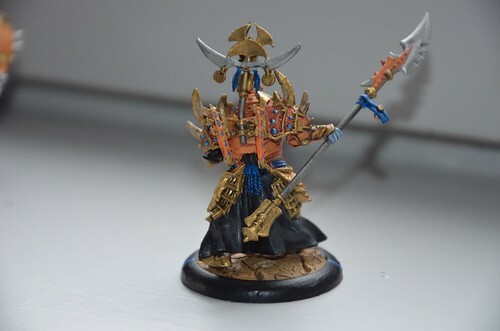 The biggest problem will be the Cetrati, I want these painted up just as decent as the other unit’s I have done so far and that means no arms attached. I will see how far I get with the other models and decide what I do with them after. At this point I thing I’ll have their bodies primed on bases, missing the arms. There’s just no way I can finish my Cetrati by Saturday AND have everything else table ready at the same time. 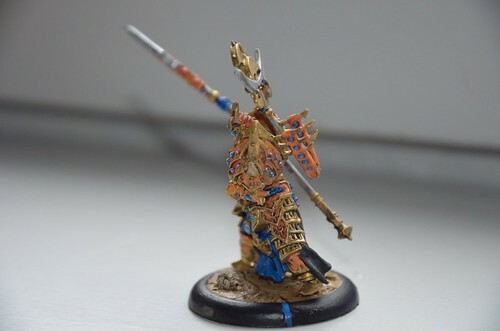 I hope pictures of the Arcuarii can be posted tonight, and I’ll see if my rush job can be pulled off or not by Saturday. 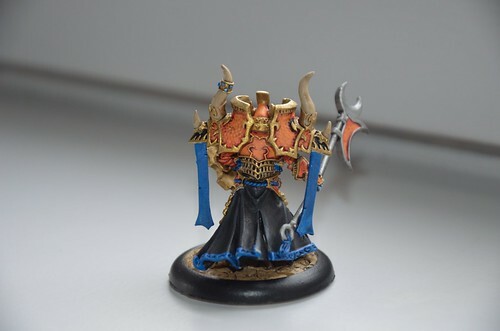 I completed the Skorne ua last weekend, just one more unit of Arcuarii and I won’t have to proxy anymore (I can borrow the other Skorne models from a friend while I’m assembling/ painting). 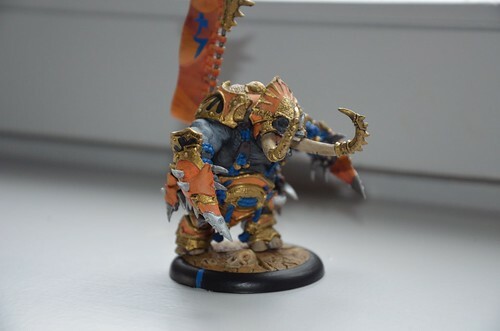 Mordrikaar has been completed and I also took some better pictures of Xerxis. 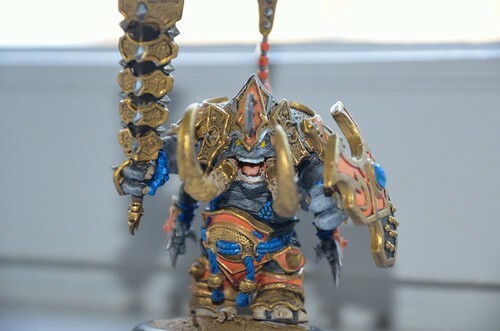 Tyrant Vorkesh is coming along nicely, hope to have him done by the end of the weekend. “Options everywhere” is pretty much the way to describe how this faction plays from my point of view. And I’m not even considering all the slam/headbutt/double handed throw possibilities yet. The logical thing to do at that point is to check what the big boys are bringing to events. 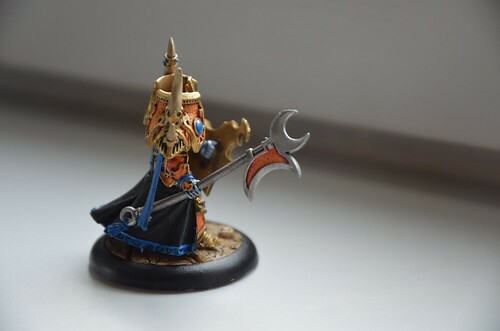 I had a look at the Skorne lists that made it to the top for the EU Masters (3 list event) and what stood out was pXerxis, Mordrikaar and Zaal were the most played casters. pXerxis, is pretty straight forward, his tier list is just solid. I have enjoyed playing this list more than anything I have fielded before. Setting all but one solo on fire in a Merc list (you know one of those with one of each solo in there 😀 ) is by far the most fun I have had in a while, especially if the important ones die to the fire rolls the turn after. 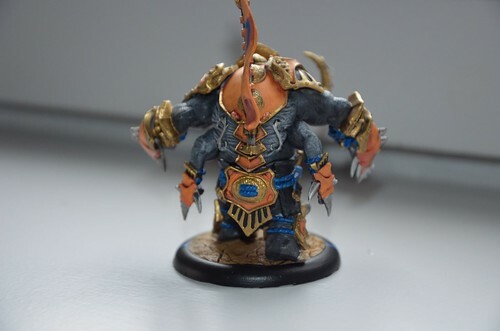 I have Tiberion in my Xerxis tier, most lists I find out on the world wide web have Molik in them, but I don’t know… I guess I’m a Tibbers fan, he seems to do the job for me. 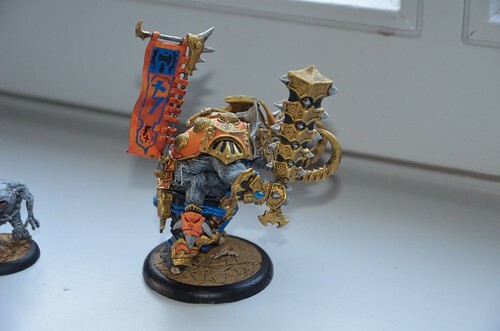 Having the orders from Xercis and the Tyrant commander available speeds the list up as well, which is handy for a brick style list, ofc so is the pathfinder and the Tyrant’s stand up order. 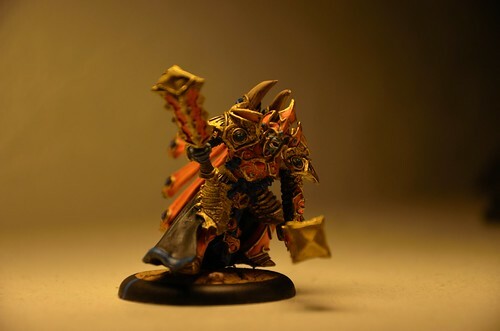 The second choice was Between Zaal and Mordrikaar, and to me Mordrikaar felt like the better choice on paper, so that’s who I chose as the 2nd caster for the pairing. So far I have had lots of fun fielding him, except maybe for a game or 2 where I just wanted to play him to build experience, regardless of the match-up and I had a few very bad match-up games. Still even during those it felt better than my games with other factions in the past, so that a fun conclusion to make. For now these lists have proven solid enough, so unless I find some serious holes in this setup, these will be the lists I’ll use in the next SR event this month. 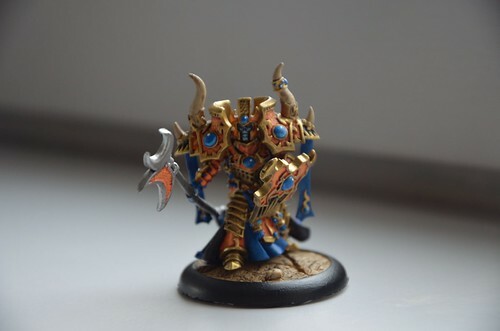 I have been rather absent from the blog for a week or so, partly due to being busy with non warmachine related matters and because I wanted to focus on finishing some models. 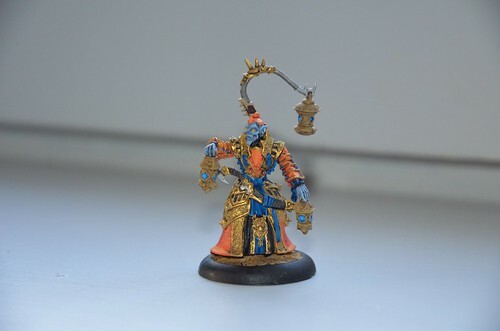 In the last week I was able to finish the first unit of Incindiarii, Tiberion, an Agonizer and last night I finished pXerxis. 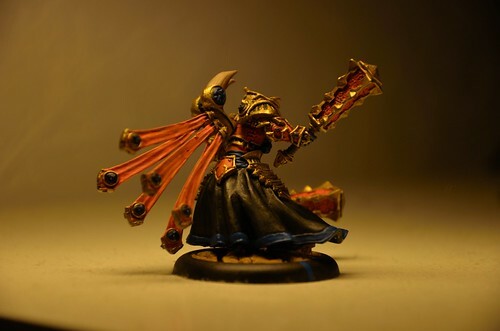 I’m planning to take my Skorne to a Steam Roller on the 25th of October and that means models will need to be assembled and painted as much as possible. 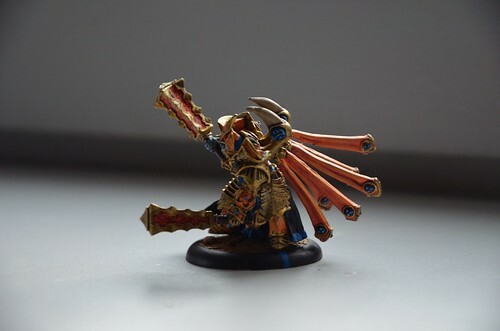 The good news is that I can borrow most of the models for the event, so I don’t have to paint a million models by that time. 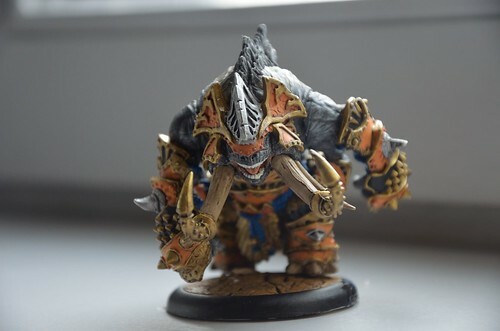 Models that will need to be finished in about 3 weeks: Mordrikaar, Vorkesh, Bloodrunners and Arcuarii. If the deadline becomes an issue I can always base mark the primed Bloodrunners and use them unpainted. 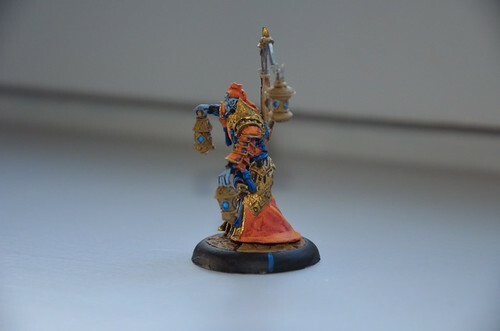 The Arcuarii are a different story as they have to be painted unassembled. 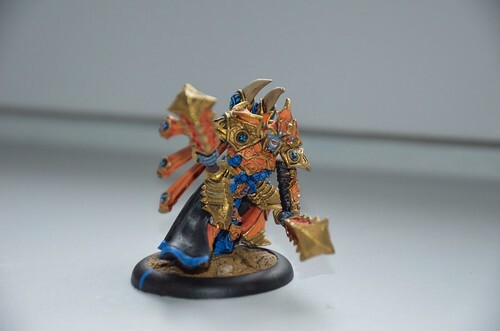 Next model on the table is Mordrikaar.